Join this fun community of over 5,000,000 members and start collecting LifePoints today. You'll earn 10 LifePoints just for signing up! 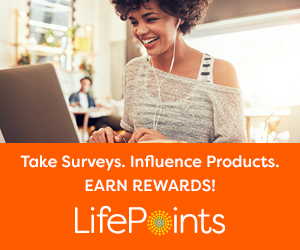 Connect with the LifePoints community, contribute by completing surveys, participate in other activities including mini polls & product testing and collect your favorite rewards including gifts cards and PayPal cash! Note: This link is open to those on a desktop or laptop to signup only. Ages 14 and older can signup.